I can't believe how FAST Christmas has creeped up on me! There were so many cute things I wanted to bake and make. I didn't even get around to making any of our traditional Christmas cookies, but my husband and I do have a date in the kitchen set to make my favorite Christmas cookie~candy cane cookies! To satisfy myself and handily make many cookies at once, I baked some cookie sheet cookies! They were made using a sugar cookie recipe and iced with gray royal icing. A playing card was used as the template for the mini cookie sheets. I also used some silver luster dust to make the cookie sheets look more authentic. After it dried I attached the mini "cookies" with royal icing. And look at all the "cookies"! There's candy cane cookies, gingerbread men, and sugar cookies! All of the "cookies" are made with either jumbo sprinkles, or pre-made (purchased) icing decorations. For the snowmen "sugar cookies", I decorated the jumbo white sprinkles with edible markers. How easy is that? Making these did help me feel a lot better about not making the larger, "real" version of all my favorite Christmas cookies:) Try it; they're very easy and fun! I think they look pretty cute too. All eight of my munchkins, together at last! As cute as the cookies are, the cuteness factor of my munchkins far exceeds them (grandmas have bragging rights ya know:)) We would like to wish you all a very Merry Christmas! I'd like to thank each one of you for your friendship and support! I had no idea that this blog would bring with it so many rewards:) Food bloggers are some of the nicest people on the planet! I look forward to continued association with all of you in 2012! 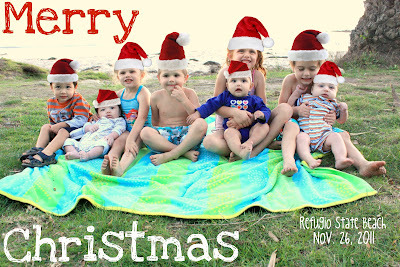 What adorable cookies and you're right, they are totally trumped by the cuteness of the pix of your babies. Fabulous! Happy holidays! Adorble cookies Sue :) have a blessed and HaPPY Holliday with your familiy and love ones. Quite possibly the most genius idea ever. Why do I love this so? I posted immediately on Edible Crafts. :). Merry Christmas to you!! Sue I am speechless. This is my favorite cookie I have seen all season. Brilliant! Air! I need air! These took my breath away! They are adorable! I'll be picking up those 1/2 priced sprinkles on Monday. I agree, there was so much I want to do. We accidentally met up with my brother and his wife and my sister and her husband at the mall last night and decided that we wanted to take a cue from the Mexican culture and continue celebrating until Jan. 6th so now we are planning a 3 Kings Day party with them. In some ways though, I am glad that it has to come to an end. I just keep doing more things. Love your card, I did an ecard for a post too. Your little Santas are just "edible" and that gingerbread boy is too cute for words. I love your cookie idea. I was so glad to read that they "cookies" were all candies. I thought you had made them all! Have a very Merry Christmas. 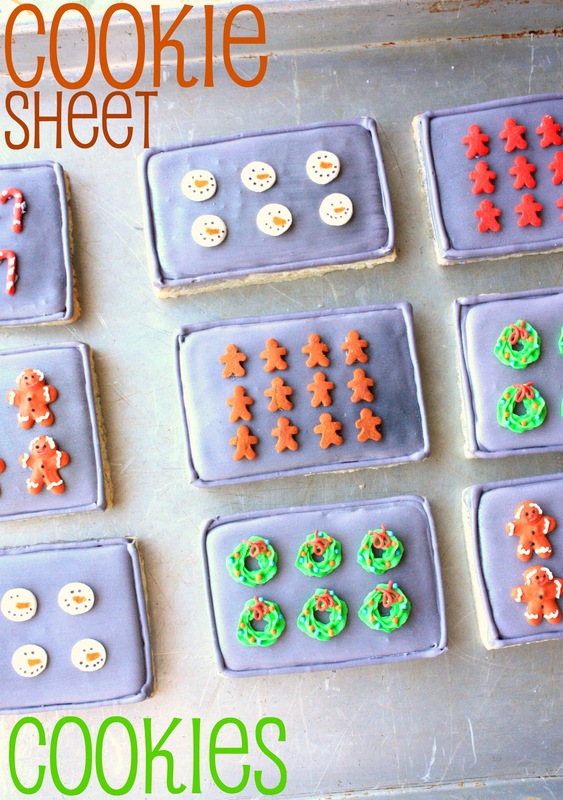 Those cookies are so stinkin' cute, I love that idea!! And LOVE the photo of all your munchkins, it's absolutely precious!! And thank you for always leaving such nice comments on my blog. I'm happy to have connected with you in blogland! The cookie sheet cookies are the sweetest but your little munchkins and especially your little gingerbread one steal the show! How sweet are your little munchkins!?! Merry Christmas, Sue! Your grandchildren are wonderful. Thank you for all you bring to the blogging world with your wonderful creations! Merry Christmas ;) wonderful family! So awesome Sue! The cookie sheets and cookies are so creative but have to agree the pic of all your real sweets is my fav (and impressive to get a good one of all the kiddos!) Merry christmas can't wait to see what 2012 brings! Loving the cookie sheet cookies! So cute!!! Your cookies are adorable, but not nearly as adorable as your munchkins. Wishing you a new year filled with all you favorite things. Your munchkins are so adorable!!! Merry Christmas!!! Just love all those tiny minis on each cookie. Merry Christmas Sue! Your cookies are super cute and what a fun idea, but you're right, those munchkins! Wowwee super cute! I can hear the proud grandma in you! I hope you have a blessed holiday! Completely amazing, Sue. I have to say you are really one of my all time favorite blogs to view. I get excited to see what you post and have lovingly copied many of your treats over the past year. I look forward to many more. I bought sweets on a stick on your recommendation and agree it is full of wonderful treats and tricks! Blessing to you and all your munchkins! WOW, what a good lookin group!!!! Sue, you have the cutest grandkids, ever. Your munchkins are adorable, absolutely precious. Enjoy them. Your cookies are the cutest, also. It is such fun to bake for the grandchildren. Sue, these are beyond cute! I don't know what to say. And your munchkins!? Faaaar beyond cute! i absolutely love your cookie sheet cookies!!! so cute and creative:) merry christmas! Those cookies are precious!!! And your grandchildren are beautiful! Sue, you make the CUTEST cookies!! Darling cookies--beautiful grandkids. So glad you got them all together. Our 14 grandbabies are all over the country. Hopefully this summer we will get them all together. They do make life sweet don't you think? The picture of all your munchkins is just adorable! Hope you had a wonderful Christmas, and I'm looking forward to reading your posts in the new year. Holy wow--your cookie sheet cookies are totally post-modern. And completely lovely. Oh my gosh. Those cookie sheet cookies are AWESOME. Pinning now! Love this! Maybe I'll try for Valentine's Day?